Lyman-alpha blobs are so called because they strongly emit radiation due to the Lyman-alpha emission line of hydrogen gas. Normally, Lyman-alpha emission is in the ultraviolet part of the spectrum, but Lyman-apha blobs are so distant, their light is redshifted to (longer) optical wavelengths. These huge bodies of gas may be precursors to galaxies. One of these objects, named Himiko (see below) for a legendary, mysterious Japanese queen, stretches for 55 thousand light years, a record for that early point in time. Himiko is located at a transition point in the evolution of the universe called the reionization epoch — it's as far back as we can see to date. "It is possible that extremely bright galactic mergers (image above) lie at the center of all the mysterious blobs, but we still don't know how they fuel the blobs themselves," said Dr. Harry Teplitz, Spitzer Science Center, California Institute of Technology. "It's like seeing smoke in the distance and now discovering that it's a forest fire, not a house or car fire, but still not knowing whether it was caused by lightning or arson." The findings will ultimately provide a better understanding of how galaxies, including ones like our own Milky Way, form. Using its heat-seeking infrared eyes, Spitzer was able to see the dusty galaxies tucked inside one well-known blob located 11 billion light-years away. The findings reveal three monstrously bright galaxies, trillions of times brighter than the Sun, in the process of merging together (image below). Spitzer also observed three other blobs located in the same cosmic neighborhood, all of which were found to be glaringly bright. One of these blobs is also known to be a galactic merger, only between two galaxies instead of three. It remains to be seen whether the final two blobs studied also contain mergers. "To figure out what's going on, we need to better characterize the galaxies at the center of the blobs," said Dr. James Colbert, Spitzer Science Center. That's where Spitzer comes in. Spitzer can sense the infrared glow from the dusty galaxies inside the blobs. 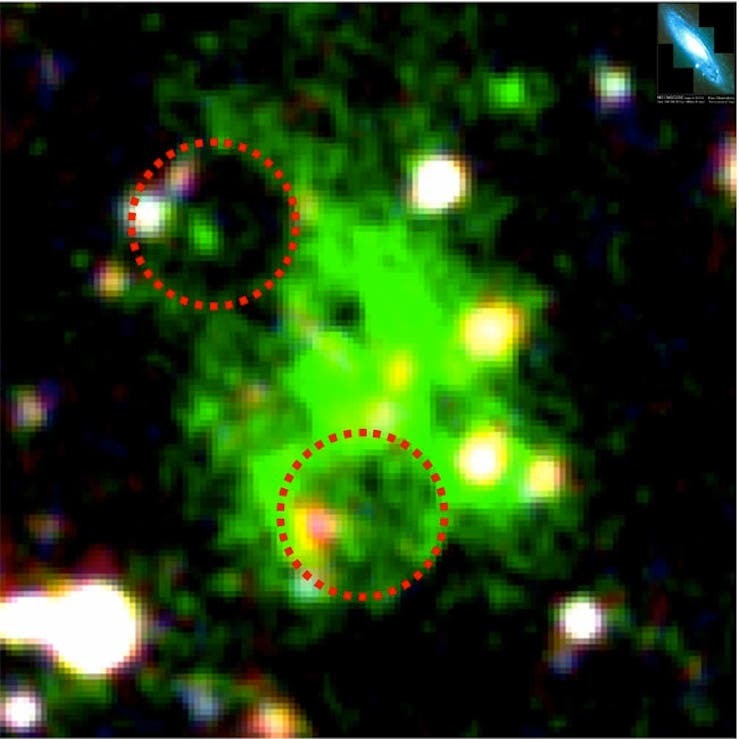 When Colbert and colleagues used Spitzer to look at four well-known blobs located in a galactic filament 11 billion light-years away, they discovered that one of them appears to be made up of three galaxies falling into each other — an unusual cosmic event (image above,right). The finding is intriguing because previous observations from NASA's Hubble Space Telescope found that another one of the four blobs surrounds a merger between two galaxies. The astronomers speculate that all blobs might share this trait; however, more evidence is needed to close the case. One clue that the scientists might be on the right track has to do with the infrared brightness of the blob galaxies. To visible-light telescopes, these galaxies appear unremarkable. Spitzer measurements revealed that all four of the galaxies studied are among the brightest in the universe, giving off the equivalent light of trillions of Suns. Such luminous galaxies are often triggered when smaller, gas-rich ones crash together, supporting the notion that galactic mergers might make up the cores of blobs. Even if galactic mergers are fingered as the culprit, the mystery of the giant galactic blobs will persist. Astronomers will have to figure out why mergers are producing such tremendous clouds of material. "Far from solving the mystery of the blobs, these observations only deepen it. Not only are the gas clouds bizarre, we now know that they contain some of the brightest and most violent galaxies in the universe," said Teplitz. One extended Lyman-Alpha blobs astronomers discovered is a mysterious, giant object that existed at a time when the universe was only about 800 million years old. This blob was named Himiko for a legendary, mysterious Japanese queen. It stretches for 55 thousand light years, a record for that early point in time. That length is comparable to the radius of the Milky Way's disk. "The farther out we look into space, the farther we go back in time, " explained Masami Ouchi, a fellow at the Observatories of the Carnegie Institution who led an international team of astronomers from the U.S., Japan, and the United Kingdom. "I am very surprised by this discovery. I have never imagined that such a large object could exist at this early stage of the universe's history. According to the concordance model of Big Bang cosmology, small objects form first and then merge to produce larger systems. This blob had a size of typical present-day galaxies when the age of the universe was about 800 million years old, only 6% of the age of today's universe!" 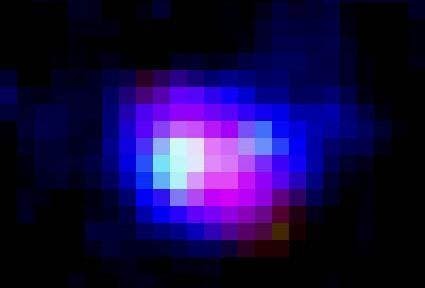 Astronomers are puzzled by the object, which they think could be ionized gas powered by a super-massive black hole; a primordial galaxy with large gas accretion; a collision of two large young galaxies; super wind from intensive star formation; or a single giant galaxy with a large mass of about 40 billion Suns. Extended blobs discovered thus far have mostly been seen at a distance when the universe was 2 to 3 billion years old. No extended blobs have previously been found when the universe was younger. "We hesitated to spend our precious telescope time by taking spectra of this weird candidate. We never believed that this bright and large source was a real distant object. We thought it was a foreground interloper contaminating our galaxy sample," continued Ouchi. "But we tried anyway. Then, the spectra exhibited a characteristic hydrogen signature clearly indicating a remarkably large distance—12.9 billion light years!" "Using infrared data from NASA's Spitzer Space Telescope and the United Kingdom Infrared Telescope, radio data from the VLA, and X-ray imaging from the XMM-Newton satellite, we were able to estimate the star-formation rate and stellar mass of this galaxy and to investigate whether it contains an active nucleus powered by a super-massive black hole," remarked James Dunlop a team member at Edinburgh. "We found that the stellar mass of Himiko is an order of magnitude larger than other objects known at a similar epoch, but we cannot as yet tell if the center houses an active and growing black hole." "One of the puzzling things about Himiko is that it is so exceptional," said Carnegie's Alan Dressler, a member of the team. "If this was the discovery of a class of objects that are ancestors of today's galaxies, there should be many more smaller ones already found — a continuous distribution. Because this object is, to this point, one-of-a-kind, it makes it very hard to fit it into the prevailing model of how normal galaxies were assembled. On the other hand, that's what makes it interesting!" The image of the gigantic, amoeba-like structure is seen as it was when the universe was a mere two billion years old — about 12 billion years ago. Normally, Lyman-alpha emission is in the ultraviolet part of the spectrum, but Lyman-apha blobs are so distant, their light is redshifted to (longer) optical wavelengths. X-ray data (blue) indicates the presence of a supermassive black hole feeding at the center of an active galaxy embedded in the blob. 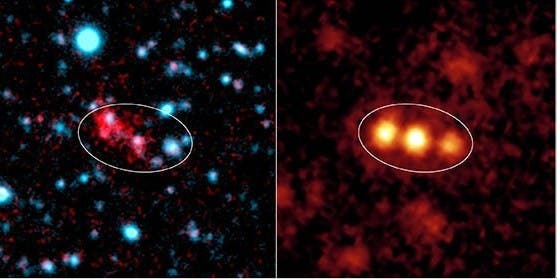 Lyman-alpha blobs could represent an early phase in galaxy formation where the heating is so great it begins to limit further rapid growth of active galaxies and their supermassive black holes. Observations with NASA's Chandra X-ray observatory have found black holes in several blobs about eleven billion light years from Earth, at the very edge of the system's detection ability. They can't quite make out the other blobs yet, but they believe that every blob has a black hole core — just as galaxies do — which powers their radiation even as it eats their matter. In fact, it's these black holes that prevents the blobs from ever becoming anything else. Such a vast cloud of matter would inevitably collapse to start creating stars unless there's something working to prop it up against gravity — the radiation from a billion-sun-sized black hole. Which is enough to do most things.